Do you have an idea? Is there something you thought of that can be useful for humanity? Nothing is more powerful that an idea, who’s time has come. If you have an idea and want to see it through to fruition, you must begin at once to fan it. An idea is like a tiny seed that wants to germinate. Unless you feed it, water it, give it sun, and proper amount of time to sprout, it will die and disintegrate in the wasteland of your consciousness. The best way to get a creative idea is to have lots of them. Stir up the imagination and think . All it takes is that one great idea. Once you have it, think about it often. Is there a business you want to start, an invention that can be useful? Keep feeding your mind with the idea and take action ever day toward it. If at first you don’t succeed try, try again. 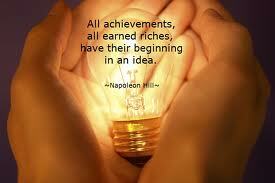 That seed of an idea will begin to grow, and before you know it the idea will have manifested into its physical form. I have an idea, lets all support each other in our ideas. This entry was posted on Monday, September 30th, 2013 at 10:37 pm and is filed under Born Rich Learning System. You can follow any responses to this entry through the RSS 2.0 feed. You can leave a response, or trackback from your own site.